The “F” series maps are our most recent set of maps taken from U.S. Forestry and Canadian topographical base. Scale is 1-1/2″ to the mile, more than twice the scale of our 1952 (100-series) maps. This map base provides the ultimate in accuracy and detail including land contours and lake bottom contours where that information is available on the Minnesota side of the border. 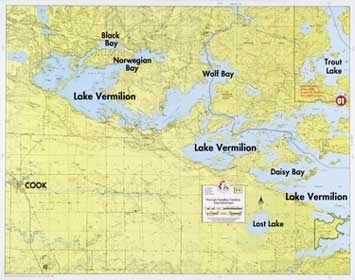 U.S. Forestry map base originates from U.S. Geological Survey source material. This “F” series of maps will be of interest to the hiker, backpacker, and hunter as well as those traveling the waters of the canoe country. The maps are printed in four colors on a polypropylene base paper affording maximum readability. They are completely waterproof and will hold up with the roughest handling. Campsite, portage, trail, and other relevant information on the Minnesota side is provided and reviewed annually by the U.S. Forest Service for accuracy.